My name is Ikwansha Singh. I believe words have the power to make people understand what actually is happening cause you're not gonna end until you complete it. Well, my story is a kind of unique. It's unique because I believe so. To study in foreign University is my dream. Not many people support you when you want to do your undergraduate in a foreign country. Same happened with me. But there's still a little change. It's like half-half. I am kind of getting partial support. 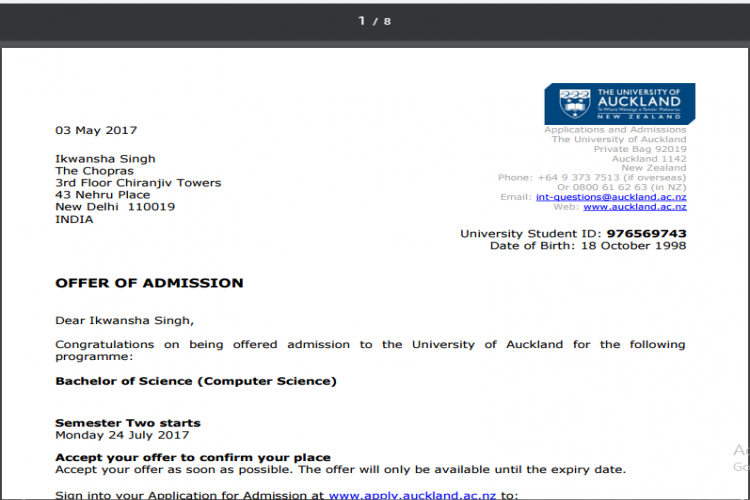 It was a wonderful day and happy news for me when I got my offer letter to study at the university of Auckland, New Zealand as a major in Computer Science. But Of course, I couldn't share this news with everyone. I even got offer letter from University College Dublin, Ireland but again couldn't go for it due to financial issues. My father is unemployed since past 5 years and he doesn't even have any collateral to keep in the bank and ask for the loan. My mum is a homemaker. So that is not even a question. I did everything I could. From giving my SAT's to applying to colleges and approaching Banks for a loan. There's no shame in asking or help. I kept this as the last option but sometimes last comes out to be the BEST. I am letting people know this because I won't be able to go for anything else. This is really my last option to fulfil my dream to study Abroad. I've attached my offer letter which I did accept a few days ago in a hope that I will definitely get what I sought with all my heart. Your share could be as good as a donation for Seema Singh! Not everyone can afford to take care of their loved ones. Seema Singh's life can only be saved by donations made by kind people like you.